Today's Gold Box deal from Amazon is the DEWALT DCK281D2 20V Max XR Lithium Ion Brushless Compact Drill/Driver & Impact Driver Combo Kit. This Dewalt 20-Volt Drill/Impact Combo Kit has a brushless motor that delivers up To 57% more run time than brushed. It has XR Li-ion batteries with fuel gauge, which provides 33% more capacity over standard packs. Both of these tools feature LED lights with a 20-second trigger release delay, providing increased visibility in dark or confined spaces. 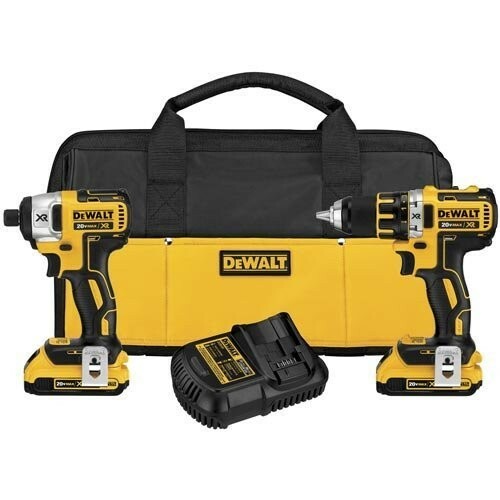 This kit also includes a DCD790 20v Max; 1/2" Drill/driver, a DCF886 20v Max Impact Driver, a DCB112 12v/20v battery charger, and 2 2.0Ah batteries to ensure you have the complete package to meet your needs.